Alloways Creek, Salem County, NJ – CES completed this project for the Salem County Board of Chosen Freeholders. At Historic Hancock’s Bridge and along the Delaware River Bay, our professionals provided complete engineering services for the design and permitting of this 900’ long, 12’ high tidal flood control project. Conceptual design work consisted of alternatives development and analysis for permit review, including revetment systems, conventional retaining walls, and other slope stabilization methods. CES addressed the poor soil conditions and severe scour potential at the site with the tied back sheet pile system design. The final design features safety railings to protect the public from falls off the bulkhead, and helical screw anchors to avoid disturbances of residential dwellings and yards. 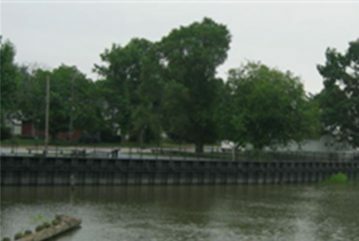 CES prepared Riparian license applications to allow construction of the bulkhead in the States’ Open Waters, and obtained Army Corps of Engineers and Individual Wetlands Permits.